Since the early Edo period, cotton was produced mainly in the Kinnai area 畿内 and Kawachi 河内国 region and many merchants lived in nearby Osaka. The seeds are sown in May and the picking starts after the O-Bon holidays in August. The fields were located in the watery rice paddies on elevated earth, called handen 半田（はんでん）」or shimabata「嶋畑（しまばた）. with more photos from the Cotton Museum of Kawachi ! Kawachi Province (河内国, Kawachi no kuni) was a province of Japan in the eastern part of modern Osaka Prefecture. It originally held the southwestern area that was split off into Izumi Province. It was also known as Kashū (河州). 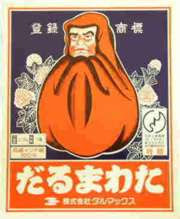 Kawachi cotton was popular from the early Edo period until before World War II; it was Kawachi's top industry. wata refers to the cotton plant with more than 40 sub-species. is another word for cotton コットン. Cotton is a soft, staple fiber that grows in a form known as a boll around the seeds of the cotton plant, a shrub native to tropical and subtropical regions around the world, including the Americas, India and Africa. The oil from cotton seed is used for cooking. Some kigo concern its harvesting and production, others things made ouf of cotton. They come in various seasons. "take the cotton padding out"
On April first (lunar Calendar), the robes and lined kimono (awase) changed from warm winter to light summer garments. 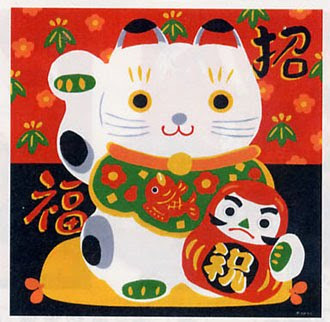 wata o nuku, this is the original of the family name Watanuki. watasuge 綿菅 (わたすげ) "cotton sedge"
To disentangle old cotton padding. Made of bamboo. The bowstring makes a nostalgic low sound, almost like a melody. 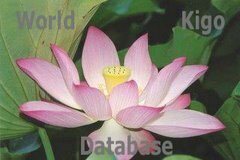 See the haiku by Basho below. This old custom of "hitting cotton" is still alive in India and many other countries and I remember this sound very well. On the 8th of September (one day before the nineth Chrysanthemum festival) cotton silk floss covers were placed outside over the chrysanthemums to catch the evening dew. On the morning of the 9th, these garments were used to wrap the body of court ladies, a custom since the Heian Period. This was said to ward off evil and lead to a healthy ripe old age. After this day, summer cotton garments were put away and the winter garments came into use. oimawata 負真綿 おいまわた "cotton garment to keep the back warm"
It used to be a cap to protect a woman from the cold in winter. Usually worn for a wedding now. Winter garments to keep you warm ! Cotton plants blossom in Yemen in the coastal plains; from summer to early autumn. I thought it's only autumn, using the stored rain water for planting and growing. The blossoms change their color in two days from white to pink in red/purple. They make bedding out of cotton. The priests clad themselves in white cotton robes to express a pure heart. Dealers transporting it to Edo made a fortune. In the latter half of the fifth century weaving technologies called "AYAHATORI" 漢織 aya-hataori and "KUREHATORI"呉織 kure-hataori were developed in the present day city of Matsusaka. Matsusaka became a very important centre in Japan for fabric production due to the introduction of these new technologies. In the year 698 textiles produced in Matsusaka were commissioned as regular offerings to the God Amaterasu at Ise Shrine. When Cotton originally from Egypt and India found its way to Japan in the 15th century, it became immediately popular among the public in Japan. It was found that conditions in Matsusaka were very good for production of this new material. This new material and the weaving technologies already in place in Matsusaka led to the birth of "Matsusaka momen" in the early 16th century. The artistic taste of the women producing this new cloth coupled with the skill of Merchants from Matsusaka led to annual sales in stores in Tokyo of 500,000 units equivalent to half of the population of Edo. The distinctive stripped pattern of Matsusaka momen which also became know as "Matsusaka jima" 松阪縞 found its roots in a cloth called "RYUJOUFU" 柳条布 originally from Vietnam. Ryujoufu as the name literally suggests resembles the strong thin pattern of the veins running through the willow tree leaves. The thin striped patterns called "SENSUJI" 千筋 and "MANSUJI" 万筋 became the traditional patterns for Matsusaka momen. Even in present day when Kabuki actors wear a stripped kimono they refer to it as wearing a Matsusaka. Such is the powerful association between Matsusaka momen and the stripe. "IKI" a concept held in great regard by people in Edo was a way of life in which they acted and appeared sophisticated, educated but cool without looking gaudy and outlandish. Matsusaka momen stripes when viewed from a distance appearing almost invisible but their delicacy and beauty appearing only when view close to, fit in perfectly with the IKI concept. So the people of Edo became to regard Matsusaka momen as a symbol of IKI. The changes in the cloths color due to washing only adding to its IKI value. The manufacturing process of Matsusaka momen is now regarded as a national treasure. Old people often say cotton is something they can’t live without even for one day, it is such a powerful spiritual asset. He had the rolls of cloth piled up high for the customers to see it easily and make their choice. By putting up different patterns every day before walking the streets of Edo, the vendors could choose their customers.
. shoshun mazu sake ni ume uru nioi kana . "Entering the country of Yamato, we came to a place called Amid the Bamboo Groves (Take no uchi) at the province of Katsuge. Because this was my company Chiri’s birthplace, we spent several days there resting our feet. There was a house deep amid the bamboo groves. deep in the bamboo groves." 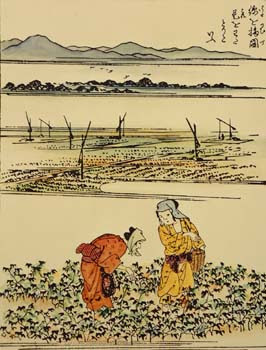 The comparison of the sounds of the cotton bow to music reminds us of the poem on the rice-planting song, in which listening to the song is described as fûryû. Although the poet does not say so explicitly, the theme of this poem is also one of fûryû. The connection between this verse and the fengliu tradition is made more apparent in another piece of short prose that introduces the circumstance of the poem. When I was staying at a place called Take no uchi—Amid the Bamboo Groves—in Yamato, the village chief often came to see me in the mornings and evenings, I assume to comfort me in the tedium of my travels. This gentleman is truly unusual. His mind wanders freely in the high while his body mingles with such common people as grass mowers, woodcutters, and hunters. Carrying a hoe, he enters the garden of Tao Qian; leading an ox, he identifies himself with the recluse at Mount Ji. He is diligent and tireless at his duties, and he also appears humble, taking pleasure in poverty. This village chief must be the kind of man who seeks retreat amid a city and really attains it. Although the village chief is not a recluse in the strict meaning of the word, this does not stop Bashô from linking him to Tao Qian and other famous Chinese recluses, nor from praising him for the detachment of his mind. Mount Ji, a mountain in modern China’s Henan province, is known as the place where the famous recluses Xu You and Cao Fu lived. As we have seen, the Zhuangzi describes Xu as a lofty recluse who valued individual freedom more than power and wealth. Without proper knowledge of the spirit of xiaoyaoyou and its embodiment in the Chinese recluse tradition, the meaning of Bashô’s narrative in the account is difficult to understand. However, Bashô and his disciples seem to have seen Daoist ideals and the recluse taste within one aesthetic tradition. In their vocabulary, “recluse” represents sheer poetic qualities, and to discover these qualities and compose poems on them are acts of fûryû　風流 FURYU. In this meaning, Bashô’s short haibun above is more an assertion of the poetics of fûryû than a depiction of the village chief. This hokku has the cut marker YA at the end of line 1, but lines 1 and 2 belong together. Basho stayed with Boncho and his wife Ukoo 羽紅, who prepared the warm garment for him. He is making a bit of fun of himself for getting older. koshiwata 腰綿 a warm cotten wrapper / blanket for the lower parts of the body to keep warm in winter. 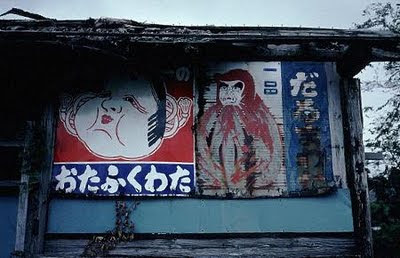 Well-loved by elderly men in the Edo period. Sometime a kind of cover was also put over the chrysanthemum flowers (kisewata 着せ綿) to protect them from early frost.
. Nozawa Boncho 野沢凡兆 and Uko 羽紅 . Kawachime refers to the girls who had to weave cotton, since the Kawachi-plain 河内平野 (now Osaka plain) was famous for cotton plants. ***** watayuki 綿雪（わたゆき) "cotton snow"
a nice translation, Gabi san and thanks for the notes as well. We can never learn enough from the great haiku masters. 4. History: As cotton was widely planted in Mashiko-Moka area, cotton fabrics were woven in the late Edo Period and marketed as "Moka Momen"(Moka cotten). It was the representative white cotton fabric of the Edo Period. Moka was the center for trading cotton in this area, thus "Moka Cotton. "They were delicate and silk like fabrics as cotton was hand spun and hand woven with the influence of "Yuki Tsumugi" pongee produced in Yuki, which is located near Moka. Special spinning wheels were used for producing thin hand spun threads. The production reached its height in the late Edo Period. However, it decreased drastically in the Meiji Period when machine spun cotton was imported and the Nagoya area began producing cotton fabrics. 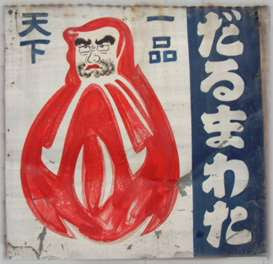 In the early Showa Period there was no production. An association for the maintenance and development of the Moka Momen started in 1986 reviving the tradition with full cooperation of local citizens. "Mashiko Momen" was originated by Hiroshi Higeta, a dyer who inherited 200 years of tradition, in 1960 with the aim of maintaining the tradition of Moka Cotton and indigo dyeing. "Oka Momen" which is used today for summer dishabille, is machine woven cotton, resembling Moka Momen. Tenjiku Shrine is the only shrine in Japan which enshrines the god of cotton. In the festival, priests pick the cotton with traditional tools (watauchi-yumi), which is a process of after using cotton gin, in traditional rites. This is a very peaceful festival. Nishio City is the cradle of Mikawa Cotton.